Who doesn’t love a good head-to-head battle, especially when it comes to cocktails? This spring the Woodward at Ames will resurrect Cocktail Wars, one of our favorite industry events, back again after a long, cold winter’s break. Cocktail Wars is an Iron Chef-style bartending competition that will take place every Sunday from now until May 15. Two of Boston’s best mixologists will go head-to-head to create the best cocktail using a series of secret ingredients (typically a spirit, a fruit, an herb, or a vegetable) in the allotted time. The creations will then be judged by some of Boston’s biggest industry experts (which on one magical upcoming Sunday will include a LUPEC lady). Thirty-two bartenders from Boston’s different neighborhoods will compete during this seven-week tournament for an amazing grand prize: a weekend in New York including roundtrip airfare, swanky hotel accommodations at one of the Morgan’s Hotel Group properties and some cold, hard cash. The stakes are high for these bar stars. For the rest of us, the event means a killer party featuring snacks, a DJ and inexpensive cocktails with some of our favorite beverage industry folks. And mix up one of these, created by New York’s John Pomeroy when the US Bartender’s Guild of New York went head-to-head with Boston as you wait with baited breath. by John S. Pomeroy, Jr. Combine ingredients in a cocktail shaker with ice. Shake and strain into a chilled cocktail glass. Garnish with a flamed lime disc. *Recent ruminations from LUPEC Boston, as published in The Weekly Dig. Women’s History Month is upon us! Today we’ll raise a glass to bartending forebroad Ada Coleman, creator of the Hanky Panky, which is also the namesake drink of LUPEC Boston founder, Misty Kalkofen. Coleman worked at the American Bar at the swank Savoy Hotel from 1903-1926, during the cocktail’s coming-out era in Europe. Owners renamed their establishments “American Bars” as a selling point—a way of distinguishing them from mere pubs or gin & tonic joints. The American craft of mixing up Sazeracs, Martinis, Ramos Gin Fizzes and the like became all the rage. Coleman’s barstools saw the likes of Charlie Chaplin, Marlene Dietrich, WC Fields, Prince of Wales and Mark Twain. Bartender Harry Craddock filled Ada’s role managing the bar in 1924, after he had left dry America for work abroad. In 1930, he published The Savoy Cocktail Book, an Art Deco gem & many a bartender’s bible. In it, for the first time, is the printed recipe for the Hanky-Panky, below. Mix one up as you toast Coley whose spirit lives on in the likes of modern bartending broad, LUPEC’s own Hanky Panky. Shake well and strain into a cocktail glass. Squeeze orange peel on top. FOR MORE GREAT STORIES AND LORE, VISIT LUPECBOSTON.COM. Who doesn’t love an Aviation? This drink is a tremendous cocktail that has been thankfully resurrected in recent years by classic cocktail cognoscenti. The drink recipe was first published in How to Mix Drinks by Hugo Ensslin, the German-born head bartender at the Wallick House Hotel in Times Square. His was the last cocktail manual to hit bookshelves before Prohibition begat the great drought in America (and now recently available in reprinted form from Mud Puddle Books.) Many consider this drink one of the last great cocktails to be invented before the Noble Experiment. The Aviation has made a glorious comeback in the past five or so years and graces the cocktail list of many a fine drinking establishment from coast to coast in 2010. The formula, however, is slightly different than the original mixture. You’ll typically find this drink made following the 1930 recipe that Harry Craddock ran in his tome, the Savoy Cocktail book, which features gin, lemon juice, and Maraschino liqueur. The aforementioned recipe makes a fine drink, to be sure. 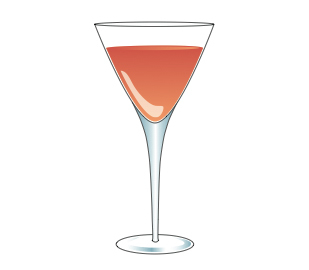 But Ensslin’s pre-Prohibition recipe used two liqueurs to give this concoction wings: Maraschino and Crème Yvette. The latter has been unavailable in the states until very recently, making this classic potation’s name a mystery. Add a hint of the new-old violet-hued Crème Yvette recently released from Cooper Spirits (or Crème de Violette if you can’t find it), and the drink takes on a sky blue hue. Aviation was still very new back in 1916 and a hot topic, thus a perfect candidate for a cocktail name. We suggest you sidle up to any bar that stocks Crème Yvette or Crème de Violette and sample the original recipe today, just because you can. Shake with ice in a cocktail shaker and strain into your favorite vintage cocktail glass. Garnish with a Maraschino cherry.